Whether it is offering prayers at historic temples, performing cultural rituals at a pilgrimage town, exploring parks or just going for a relaxing picnic, Delhi is a great place for a spot of leisure and recreation. If you are looking to escape the city and head out for a short outing, follow our guide to the best places to visit near Delhi for a day. Faridabad is a good option for a one-day trip near Delhi because of its close proximity to the city. At this industrial city, there are a few sites to explore such as Baba Farid’s tomb and the Raja Nahar Singh Fort. Architecture lovers or those looking for a spiritual experience will love experiencing the Shree Jagannath Temple, constructed in the typical Indian architectural style. The Camp Dhauj Lake is another great place to see, where you can enjoy adventure sports. At this fun location, you can participate in a plethora of activities such as rock climbing, rappelling, and an obstacle course. Situated on the highway that leads to Alwar, Sohna is a popular weekend destination for many Delhiites. Surrounded by natural beauty and having pleasant weather, Sohna is just the right place for anyone looking to get away for the day. A must-see site for anyone visiting Sohna is the Kamboj Ruins. Other popular attractions are the Damdama Lake, where you can enjoy boating, the Sohna Lake and Water Springs (known for its healing properties), and the Bharatpur Hill Fort. A perfect place to spend a couple of days, the town of Manesar is famous for its adventure sports. Manesar is one of the few places in India that offers air safaris, a thrilling airborne adventure sport. Besides this, at Manesar, you’ll also find a golf course and an adventure camp. Those looking for spiritual bliss can visit the beautiful Mata Sheetla Devi Temple. If you have time on your hands, we suggest that you visit the Sultanpur Bird Sanctuary that isn’t too far away from Manesar. An excellent spot for a one day trip near Delhi. Farrukhnagar is a historic town that is located close to Delhi. A good way to spend the day in Farrukhnagar is to visit the historic sites in this rustic town. You could use to remaining time to explore the busy main bazaar that houses shops selling traditional handicraft items and Indian ethnic wear. A popular tourist attraction in Farrukhnagar is the Sheesh Mahal. 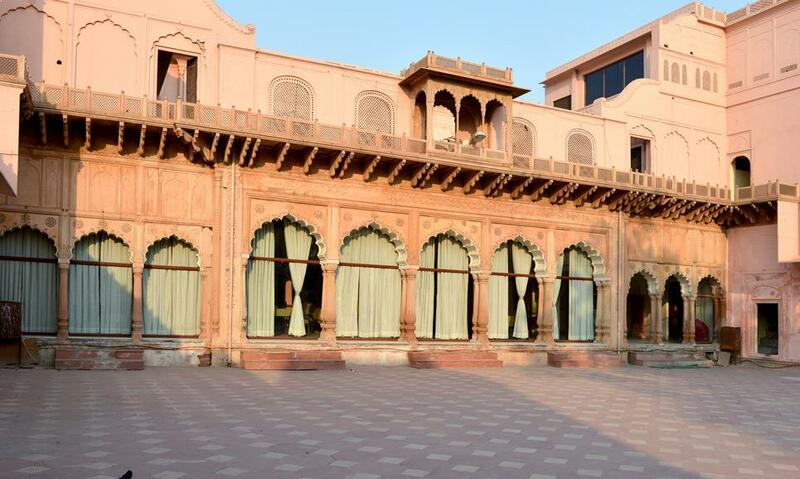 It was built using red sandstone and is very typical of traditional Mughal architecture. The Farrukhnagar Fort is also something that’s not to be missed. At the Fort, don’t forget to get a picture of the steep wall that was constructed by Ghaus Ali Shah. 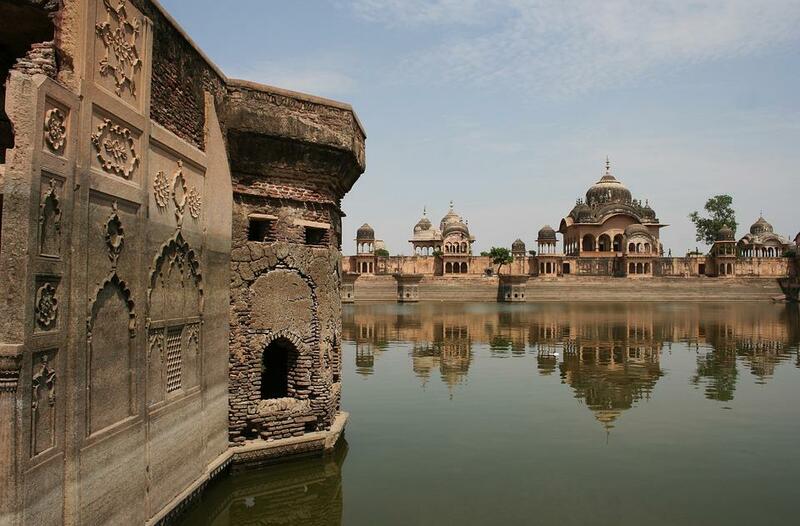 Those who adore Indian architecture can visit the Sethani Ki Chhatri. Distance from Delhi: 57 kilometers. The banks of the Damdama Lake are a great place for anyone looking to get some peace and tranquility. Surrounded by the Aravalli Hills, the picturesque lake is the perfect place for boat rides and bird watching. At the Damdama Lake, many families and groups come with their blankets and food baskets to enjoy picnics. On the banks of the lake, there is a vast open land where kids can also enjoy playing games like kho kho, frisbee, and throwball. Just near the Damdama Lake, there are a few restaurants that serve delicious local foods. Situated on the outskirts of Delhi, Nuh is the ideal getaway for anyone looking to explore history and old architecture. In this town, you’ll find plenty of beautiful historic attractions that were built using grey quartzite and red sandstone. Of all the historic sites in Nuh, two of the most visited places are the Tomb of Sheikh Musa and the Chui Mai Pond and Water Tank. For a unique experience, we suggest that you also visit the Temple of Hathor, built in honor of the Egyptian goddess. The village of Kuchesar is an excellent offbeat destination for anyone looking to escape hectic Delhi life. An ideal place for a one day trip near Delhi, the village of Kuchesar is well known for its Mud Fort that was believed to have been built in the 16th century. Also popular here is the Kuchesar Fort, the Mukteshwar Dham, and a few temples. One of the unique experiences to enjoy in Kuchesar is the bullock cart safari that takes you on a tour of the village, the traditional way. In the holy city of Garhmukteshwar, you will find many magnificent temples that are deeply rooted in Indian culture. The town is very popular as a pilgrimage destination with people from all over India visiting throughout the year. Must visit sites in Garhmukteshwar are the Ganga Temple, the 80 Sati Pillars, and the Mukteshwar Mahadev that has a huge statue of the Shiva Linga. The best time to visit Garhmukteshwar is during the Ganga Fair that is held on the Full Moon Day in the Hindu month of Kartik. The drive to the Unchagaon Fort is ideal for anyone looking for places to visit for a day trip. At this historic fort that is now a hotel, you’ll be treated to many activities such as horse rides and village tours. At the hotel, you can also see how pots are made and even maybe catch a glimpse of dolphins at the nearby portion of the river Ganga. Located just a few hours away from Delhi by road, Vrindavan is a town that resonates with Lord Krishna, the town is believed to be Lord Krishna’s childhood abode. Go here to explore the many temples that are beautifully designed using traditional Indian architecture. Some well-known temples in Vrindavan are the Mirabai, Gokulananda and Radha Raman temples that are historically rooted in Indian culture. 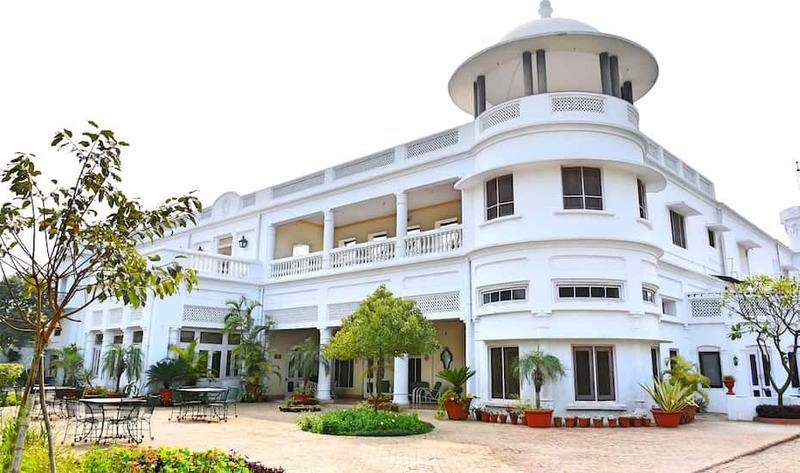 If you are looking to spend the night in Vrindavan, there are plenty of great homestays and resorts to stay at. If you are going to Vrindavan during the winter or during the festival of Holi, we suggest that you book your hotel rooms in advance. The Sariska National Park is located in Rajasthan, but it’s not that far away from Delhi. However, you’ll have to get to the park early to make the most of your trip. At the Sariska National Park, you can see some endangered species of animals such as lions, tigers, and a few other wild animals. The best option of touring the park is to take a safari. Cost of a safari ranges from Rs. 500 to Rs. 600. Keep in mind that the park is only open from October until May. The timings of the park are from 6 am to 3.30 pm. Take a one-day trip to Bharatpur for two reasons: first, a drive through the scenic roads that lead to the bird sanctuary; second, the bird sanctuary. There are two ways to explore the park, either you tour the park on foot or hire a rickshaw that costs Rs. 70 per person. The rickshaw driver will not only take you through the bird sanctuary, he’ll also be your tour guide and fill you in on some interesting facts about Bharatpur and its surroundings. Located just a short drive away from Delhi, Agra is home to India’s most iconic structures and forts. The highlight here, of course, is the famous Taj Mahal – a magnificent work of art. The best time to visit the Taj is at dawn or dusk when the sun rises and sets. It is a beautiful sight in this glowing lighting. Other great sites in Agra include the Agra Fort and Akbar’s Tomb. You can also enjoy a few snacks at the popular Sheroes Cafe, run by a survivor of an acid attack. Besides these place, there are places like Ajmer, Bandhej, Bhandarej, and a few hill stations in Uttarakhand that you could go to, but you’ll probably need more than a day to enjoy these places to the fullest. Hence, we’ve picked out these 12 places to visit near Delhi for a day because you can enjoy them and be back in your own bed by the night. If you have any questions regarding traveling from Delhi, we will be happy to answer them for you. We’d also like to know about your favorite things to do while you’re exploring a place. Do let us know in the comments section below. 30 of the Top-Notch Discos in Delhi to Spend Your Weekend At!